Dynasty USA and The Blue Devils are very proud to introduce a powerful audio visual teaching aid titled, Dynasty of Brass. Wayne Downey and the Blue Devils brass staff have created a powerful resource for teachers and students alike. The DVD's 5.1 Surround Sound performance examples and downloadable exercises combined with the multi-angle DVD environment are being applauded as a revolution in educational media. Featuring The Blue Devils – it's an all INSPIRING AND EDUCATIONAL EXPERIENCE. What a great DVD production and concept. The well focused strategies to solve the problems of breathing, tone production, intonation and balance is a must-have for all serious band directors. 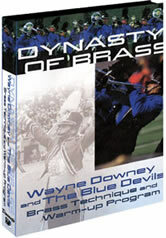 Wayne Downey's Dynasty of Brass DVD is without a doubt the finest educational vehicle of it's kind. It's a must purchase for every band director in the country. At Lassiter we plan to use the technique and warm-up program every day. We loved your DVD brass technique program! It really improved the characteristic sound of The University of Alabama Million Dollar Band. Your new DVD Dynasty of Brass is a great resource for teachers and a powerful learning experience for students. The performance examples and downloadable exercises are invaluable teaching tools. The Dynasty of Brass DVD is now a part of our training program for Teaching Assistants and Section Leaders for the UCLA Bruin Marching Band. What a wonderful resource for band directors and student teachers. In short, Wayne Downey's Dynasty of Brass DVD is awesome. Wayne's ideas and philosophies will give each of us in the marching band business a much needed reality check in how much deeper our teaching and training techniques could be. Wayne's DVD Dynasty of Brass gave me not only the "What to do" and the "How to do it" but also the "Why of doing it". Although our British-style brass band doesn't march, the concepts are so musically sound that they have been extremely beneficial for us. This DVD is a true bench mark in music education.